Cora checked in and found a message waiting for her from Harry Belcher. I have instructed the staff at the hotel to send a messenger to me when you get there. I should be arriving shortly after that as my bank is only minutes away. I can’t wait to greet you in person. Cora read the missive and smiled. It was so like Harry to come to greet her right away. A deep, familiar voice came from behind her. But that was impossible…she slowly turned toward the sound. He held his hat in his hands, rolling the brim and crushing the felt between his fingers. His black suit and tie fit him well and his tanned skin was stark against the white of his shirt. She remembered his beautiful blue eyes, but the gray in his brown hair was new. He took a step toward her and she saw his limp. Another male voice called to her from across the hotel lobby. She looked up and saw Harry Belcher crossing the room toward her. He looked just like the picture he’d sent her. He had blond hair, parted in the middle and slicked down. She knew from her correspondence with him that his eyes were green. The tan three piece suit, with brown tie and top hat would have washed out his pale skin, but the blue shirt he wore with the suit added color to his face. “Cora, I’ve come home to you,” said Asa. She looked back and forth between Asa and Harry and burst into tears. “Cora, are you alright?” called Nellie on her way to her room. “Yes, I’ll be fine,” said Cora, sniffling. Nellie nodded and went on her way. Cora turned back to the two men, each vying for her attention and each demanding that she marry him. “Well, I never,” huffed Harry. Asa looked smug and Cora wanted to wipe that look off his face. “The number is seven. Asa it is. Pick me up here at seven o’clock.” Cora turned on her heel and walked toward the stairs to her room. Harry snorted. “If you’d really loved her, you wouldn’t have disappeared from her life for so long.” He turned and left the hotel. That stung and Asa knew he was right, but he’d been scared. He’d awakened in a field hospital minus his left leg below the knee. His immediate thoughts were he wanted to die because he was no longer a man. Cynthia Woolf is the award winning and best-selling author of twelve historical western romance books and two short stories with more books on the way. She was born in Denver, Colorado and raised in the mountains west of Golden. She spent her early years running wild around the mountain side with her friends. 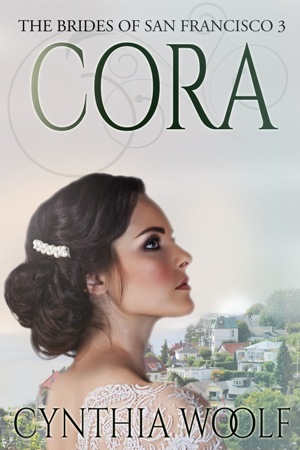 **SPECIAL GIVEAWAY**: Cynthia is giving away a paperback copy (US only) or ebook copy (International) of CORA to one lucky reader who comments on her *Author Peek* Interview or Karen’s Killer Book Bench blogs. Don’t miss the chance to read this book! Thanks, Cynthia, for sharing your story with us! Thanks again for having me this week, Karen. I appreciate getting to meet your readers. I love your mail order bride series. Cora sounds like quite the catch. It’s wonderful to have you back, Cynthia! Like Jan K. I love your matchmaker series. What a dilemma you’ve given Cora! Cannot wait to discover who she ultimately chooses!! Just recently purchased “Jake.” Your new series of mail order brides will bring back some of the dilemma’s of women at that time period. Looking forward to finding out why Asa didn’t let her know he was alive. Judith, Thank you for picking up Jake. I hope you like him. He’s one of my favorites. Oh heck, they are all my favorites. LOL I do try to bring some of the danger that mail order brides faced to my books, but in the end they are romances and they do have HEA’s, no matter what. Jan K. Thank you I love hearing that people like my work. Glenda, Cora is a strong woman I fell in love with her. Glad you like the excerpt. I would like to read it sounds good, !! Thank you Beverly, I hope you like it. BN, thanks for stopping by.